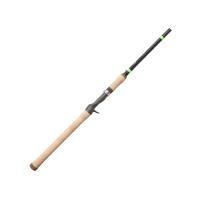 Click the button below to add the G. Loomis E6X Walleye Casting Rod to your wish list. G. Loomis E6X Walleye Casting Rods offer the best in durability, sensitivity, and balance. These rods are specifically designed to meet the needs of walleye anglers. These rods utilize Multi-Taper Technology and single-taper mandrels to provide lightweight blanks with precise actions and lengths. G. Loomis E6X Walleye Casting Rods are built with quality components including premium cork grips, Fuji reel seats, and Fuji guides. G. Loomis E6X Walleye Casting Rods are made in the U.S.A.